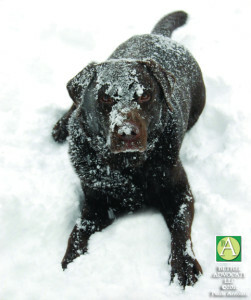 Cold weather poses serious threats to your pets’ health. Here are some tips to keep your pets safe during cold weather. Antifreeze is a deadly poison, but it has a sweet taste that may attract animals and children. Wipe up spills and keep antifreeze (and all household chemicals) out of reach. Coolants and antifreeze made with propylene glycol are less toxic to pets, wildlife and family. Read more about pets and antifreeze here. If you encounter a pet left in the cold, politely let the owner know you’re concerned. If they don’t respond well, document what you see: the date, time, exact location and type of animal, plus as many details as possible. Video and photographic documentation (even a cell phone photo) will help bolster your case. Then contact your local animal control agency or county sheriff’s office and present your evidence. Take detailed notes regarding whom you speak with and when. Respectfully follow up in a few days if the situation has not been remedied. Click here to learn more. I just want to tell you that I am newbie to weblog and seriously enjoyed you’re website. Very likely I’m going to bookmark your site . You amazingly come with excellent articles. Many thanks for sharing your blog site. him as nobody else realize such specified about my difficulty. au secours j’ai 23 ans j’ai aucun diplôme serrurier ? You actually make it appear so easy with your presentation however I in finding this topic to be really something which I think I might never understand. It sort of feels too complex and very extensive for me. I am taking a look ahead for your subsequent submit, I will try to get the grasp of it! hello!,I like your writing very a lot! share we be in contact more about your article on AOL? I require an expert on this space to resolve my problem. Maybe that is you! Taking a look ahead to look you. Great remarkable issues here. I¡¦m very glad to look your article. Thanks so much and i’m looking ahead to touch you. Will you kindly drop me a e-mail? magnificent post, very informative. I ponder why the opposite specialists of this sector don’t realize this. You must continue your writing. I’m sure, you’ve a huge readers’ base already! Wow, incredible blog structure! How lengthy have you ever been blogging for? you made running a blog look easy. The total look of your site is fantastic, let alone the content! Hello there, I do believe your website may be having internet browser compatibility problems. hey there and thank you for your info – I’ve definitely picked up anything new from right here. I did however expertise some technical issues using this website, since I experienced to reload the site a lot of times previous to I could get it to load properly. I had been wondering if your web host is OK? Not that I am complaining, but sluggish loading instances times will sometimes affect your placement in google and could damage your quality score if ads and marketing with Adwords. Anyway I am adding this RSS to my e-mail and can look out for much more of your respective exciting content. Ensure that you update this again very soon.. Thank you, I have just been searching for information about this topic for ages and yours is the greatest I have came upon till now. However, what in regards to the bottom line? Are you positive about the source? I’m still learning from you, but I’m improving myself. I absolutely liked reading all that is written on your website.Keep the stories coming. I loved it! wonderful points altogether, you simply received a new reader. What would you suggest in regards to your submit that you just made some days in the past? Any sure? I would like to thnkx for the efforts you have put in writing this blog. I am hoping the same high-grade web site post from you in the upcoming as well. Actually your creative writing skills has encouraged me to get my own website now. Really the blogging is spreading its wings rapidly. Your write up is a good example of it. I definitely wanted to write a comment to be able to thank you for all the awesome recommendations you are writing on this website. My prolonged internet research has at the end of the day been rewarded with professional strategies to exchange with my friends and classmates. I ‘d claim that most of us visitors actually are quite endowed to exist in a good network with very many perfect professionals with very helpful hints. I feel rather fortunate to have seen your web pages and look forward to really more thrilling minutes reading here. Thanks a lot once again for everything. Useful information. Lucky me I found your website by chance, and I’m surprised why this coincidence didn’t came about earlier! I bookmarked it. Magnificent website. Plenty of useful info here. I am sending it to some pals ans also sharing in delicious. And naturally, thanks on your effort! Thanks for another excellent article. Where else could anyone get that type of information in such an ideal approach of writing? I’ve a presentation next week, and I’m on the look for such information. Good ¡V I should certainly pronounce, impressed with your site. I had no trouble navigating through all tabs as well as related information ended up being truly simple to do to access. I recently found what I hoped for before you know it at all. Reasonably unusual. Is likely to appreciate it for those who add forums or anything, site theme . a tones way for your client to communicate. Nice task..
great publish, very informative. I wonder why the opposite experts of this sector don’t realize this. You should proceed your writing. I am sure, you have a huge readers’ base already! Good day here, just turned aware of your webpage through Google, and have found that it is really interesting. I’ll value if you carry on such. I am commenting to let you understand of the outstanding experience our child found going through your web page. She picked up plenty of pieces, which include what it’s like to possess an excellent coaching character to get other folks without hassle comprehend certain very confusing things. You really did more than people’s expectations. Thanks for coming up with those productive, trusted, revealing and in addition cool guidance on your topic to Jane. My spouse and i felt so peaceful Ervin could conclude his basic research through the entire precious recommendations he got using your blog. It is now and again perplexing to just happen to be making a gift of tactics which the others could have been selling. We grasp we now have the blog owner to thank because of that. All the explanations you’ve made, the simple website navigation, the relationships your site help engender – it’s got many sensational, and it is aiding our son in addition to our family understand this content is brilliant, which is certainly incredibly indispensable. Thanks for the whole thing! Thank you for some other excellent post. Where else may just anyone get that type of info in such an ideal manner of writing? I have a presentation subsequent week, and I’m at the search for such information. hello there and thank you for your information – I have definitely picked up anything new from right here. I did however expertise a few technical issues using this site, since I experienced to reload the web site a lot of times previous to I could get it to load properly. I had been wondering if your web host is OK? Not that I’m complaining, but slow loading instances times will sometimes affect your placement in google and could damage your high quality score if advertising and marketing with Adwords. Anyway I’m adding this RSS to my e-mail and can look out for much more of your respective fascinating content. Make sure you update this again very soon.. I wish to point out my love for your generosity giving support to individuals that really need guidance on the matter. Your real commitment to getting the message all around had been unbelievably practical and has constantly made those much like me to get to their aims. Your personal useful suggestions can mean this much a person like me and somewhat more to my peers. Thank you; from everyone of us. certainly like your web-site but you have to take a look at the spelling on several of your posts. Many of them are rife with spelling problems and I to find it very bothersome to inform the truth nevertheless I will surely come back again. I am looking ahead for your next submit, I’ll try to get the hold of it! Yo solo digo que estais mu tontos pa poneros a hablar de cosas serias aquÃ­ no? esto es para re2esr­&#8Ã30; Cuando sacaron el de “la huelga de metro saca a los feos a la calle” me reÃ­, a pesar de que soy feo como un demonio. You really make it appear so easy along with your presentation however I to find this topic to be actually something that I feel I might by no means understand. It kind of feels too complex and extremely wide for me. I’m taking a look ahead to your next post, I¡¦ll try to get the cling of it! I definitely wanted to develop a note to express gratitude to you for some of the fantastic points you are giving out on this website. My time-consuming internet investigation has at the end been recognized with reliable tips to share with my close friends. I ‘d assume that we readers are quite fortunate to exist in a fine website with so many lovely people with helpful suggestions. I feel really lucky to have used your entire web site and look forward to many more entertaining minutes reading here. Thanks once again for everything. Wonderful goods from you, man. I have understand your stuff previous to and you are just extremely magnificent. I really like what you have acquired here, certainly like what you’re saying and the way in which you say it. You make it enjoyable and you still care for to keep it wise. I can not wait to read much more from you. This is actually a terrific site. hello there and thank you for your info – I’ve certainly picked up anything new from right here. I did however expertise a few technical issues using this site, as I experienced to reload the site a lot of times previous to I could get it to load properly. I had been wondering if your web host is OK? Not that I’m complaining, but sluggish loading instances times will sometimes affect your placement in google and can damage your high quality score if advertising and marketing with Adwords. Anyway I am adding this RSS to my e-mail and could look out for much more of your respective exciting content. Make sure you update this again very soon.. Thanks so much for providing individuals with an extremely brilliant possiblity to check tips from this blog. It is always so brilliant and also jam-packed with fun for me personally and my office co-workers to visit your blog really three times per week to find out the latest guides you have got. Of course, we are certainly fascinated with your unbelievable concepts you give. Certain 1 areas on this page are really the most beneficial we have ever had. Great ¡V I should certainly pronounce, impressed with your web site. I had no trouble navigating through all tabs as well as related information ended up being truly easy to do to access. I recently found what I hoped for before you know it in the least. Quite unusual. Is likely to appreciate it for those who add forums or something, site theme . a tones way for your client to communicate. Excellent task.. I have been exploring for a little for any high-quality articles or weblog posts in this kind of area . Exploring in Yahoo I at last stumbled upon this site. Reading this information So i¡¦m glad to convey that I’ve a very excellent uncanny feeling I found out just what I needed. I so much without a doubt will make sure to do not overlook this website and give it a look on a constant basis. I’ve been browsing online greater than 3 hours nowadays, but I never found any fascinating article like yours. It¡¦s lovely price enough for me. In my view, if all webmasters and bloggers made just right content as you probably did, the net will be much more helpful than ever before. I precisely wanted to thank you very much once more. I do not know the things I would’ve gone through in the absence of the type of ideas documented by you about this industry. This was an absolute troublesome problem in my opinion, nevertheless viewing a specialized style you treated the issue forced me to jump with gladness. I’m thankful for your advice as well as believe you recognize what a great job you have been getting into instructing most people through the use of your webblog. I am sure you have never encountered any of us. Whats Taking place i am new to this, I stumbled upon this I’ve discovered It positively helpful and it has helped me out loads. I’m hoping to give a contribution & assist other users like its aided me. Great job. Thank you for sharing excellent informations. Your web site is very cool. I’m impressed by the details that you have on this website. It reveals how nicely you perceive this subject. Bookmarked this web page, will come back for more articles. You, my friend, ROCK! I found just the information I already searched all over the place and simply couldn’t come across. What a perfect web site. My wife and i ended up being very cheerful Raymond managed to do his investigation from the precious recommendations he got from your very own web pages. It’s not at all simplistic just to choose to be giving freely instructions some other people might have been trying to sell. We do understand we now have the blog owner to give thanks to for that. Most of the illustrations you’ve made, the straightforward blog menu, the relationships you will help to create – it’s many fantastic, and it is facilitating our son in addition to our family feel that that subject matter is amusing, and that is highly important. Thank you for the whole lot! Great tremendous things here. I am very glad to see your post. Thank you a lot and i’m looking ahead to touch you. Will you kindly drop me a e-mail? I really wanted to make a small message to say thanks to you for all of the great concepts you are posting on this site. My considerable internet lookup has now been recognized with awesome suggestions to exchange with my company. I would declare that many of us visitors actually are truly blessed to exist in a useful website with very many brilliant people with very beneficial ideas. I feel rather lucky to have seen the web pages and look forward to really more brilliant moments reading here. Thanks once more for everything. Whats Happening i’m new to this, I stumbled upon this I have found It positively useful and it has helped me out loads. I am hoping to give a contribution & help other customers like its helped me. Good job. Thanks for some other excellent article. Where else could anybody get that type of info in such a perfect way of writing? I have a presentation subsequent week, and I am on the look for such information. I’ve been surfing on-line greater than 3 hours these days, yet I by no means found any attention-grabbing article like yours. It is pretty price sufficient for me. In my view, if all webmasters and bloggers made good content as you probably did, the web can be a lot more useful than ever before. of course like your web site but you have to check the spelling on several of your posts. Several of them are rife with spelling issues and I to find it very troublesome to inform the truth then again I¡¦ll certainly come back again. hello!,I love your writing so so much! proportion we be in contact more approximately your article on AOL? I require a specialist in this house to resolve my problem. Maybe that is you! Looking ahead to peer you.